Action Signs is one of very few Colorado vendors recognized by 3M as a graphics manufacturer and backed by the 3M™ MCS™ Warranty. The Warranty allows us to confidently supply our customers with exceptional products that are guaranteed for up to five years. The Certificate of3M™ MCS™ Warranty affirms that 3M will stand behind graphics made with 3M products and processes—a promise that extends to us, the graphic manufacturer, and our customers. 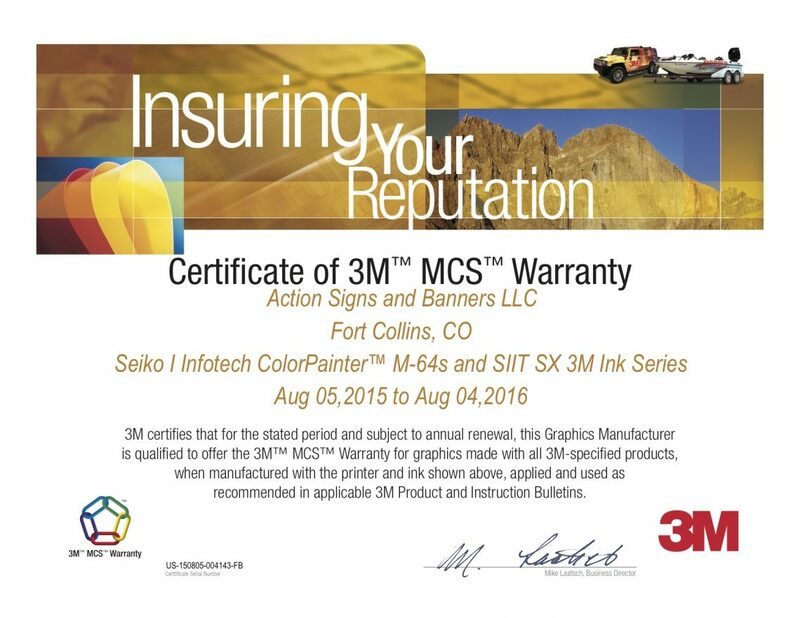 The Certificate of 3M™ MCS™ Warranty demonstrates our commitment to providing you with quality 3M graphics that stand the test of time. The 3M™ MCS™ Warranty set the industry standard more than 20 years ago and is still solid gold. It covers finished graphics using products designed and tested for optimal compatibility and performance for jobs that demand the very best.